Your Hiveword account includes a dashboard with all your works in progress arranged by title, along with when they were created, stats on how much work you've done on them, and the last time you updated the info. For those of you who like me are quantum writers and work on several projects at the same time, this can help you track your progress and productivity on multiple WIPs. Each story you archive on Hiveword has a main title page where you can record a subtitle, what name you're writing under, and a summary of the story. Here I've plugged in the summary for my novel crash dummies' book, and the summary area is a great place to work on a draft of your outline or synopsis. 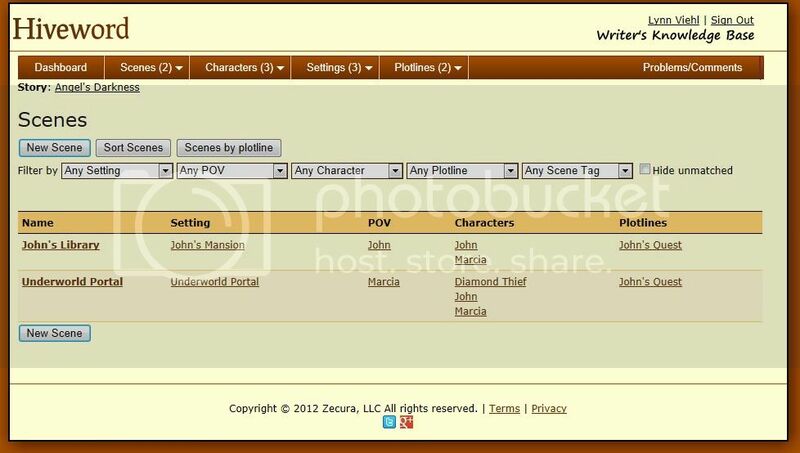 As you compile scenes on Hiveword, it keeps track of them, and generates a list of them for each project. This is great because you can track how often you switch settings, POV, plotlines and keep track of who appears in what scene. 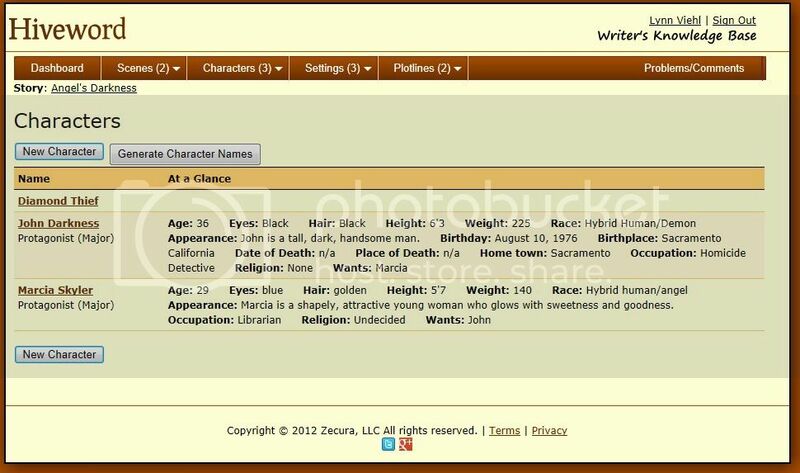 Hiveword also compiles lists of your characters as you make them up and provides an at-a-glance summary of things like attributes, occupations, motivations, etc. If you're working on a project with a big cast of characters I don't have to tell you how valuable this is. The service also compiles lists of settings in the story, as well as a snapshot of your description of them. There's a button on the settings list page that offers you the option to you generate place names if you need them, and provides maps and links to info about the generated results. By selecting the "add setting" button you can add any of the results you like directly into your story. 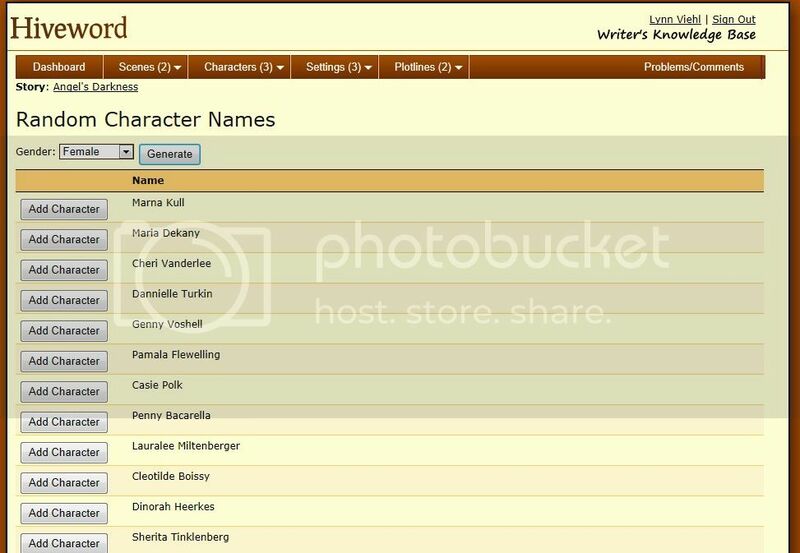 You can also use a similar button to generate random character names, and add those you like from the results to your story. There is much more to Hiveword than what I've mentioned, so it's worth taking it for a test-drive yourself to see all the features. Hiveword is so great at helping organize your story info and elements that it's like having your own personal story assistant. You can use it for other purposes as well, such as outlining those bright, shiny and very distracting new story ideas so you can get out of your head. 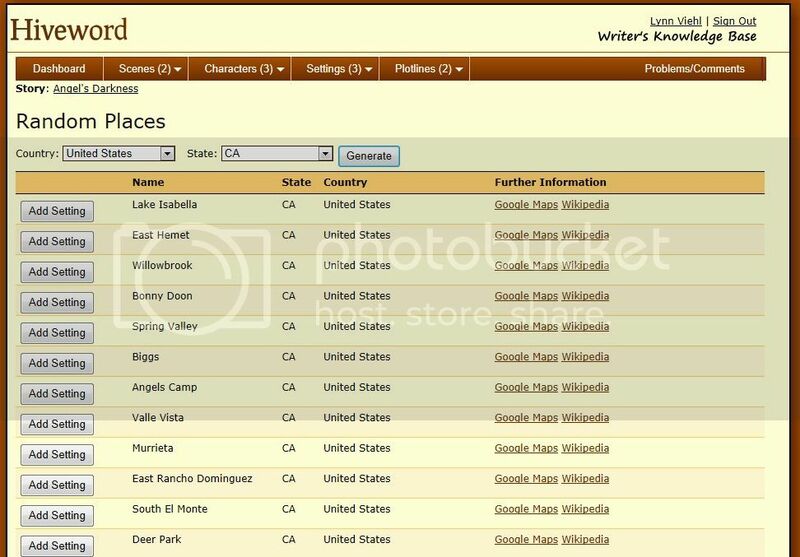 For those of you who are series writers, Hiveword would serve as an excellent encyclopedia to keep a running record of your characters, settings, plots and details from every novel. If you're on the phone with an editor, you can consult Hiveword on details from your book for pitches, editorial discussions or to answer those pesky impromptu questions (like "Hey, what Chapter did Marcia find out John was also the demon thief?") You pantsers might not have to backtrack through your manuscripts as much if you take a few minutes after your work sessions to record details of what you've already written in a Hiveword file. The very best thing about Hiveword is that right now it's free* for anyone to use, so you don't have to pay to play with it (and according to Mike Fleming's blog, he's keeping it free for National Novel Writing Month.) 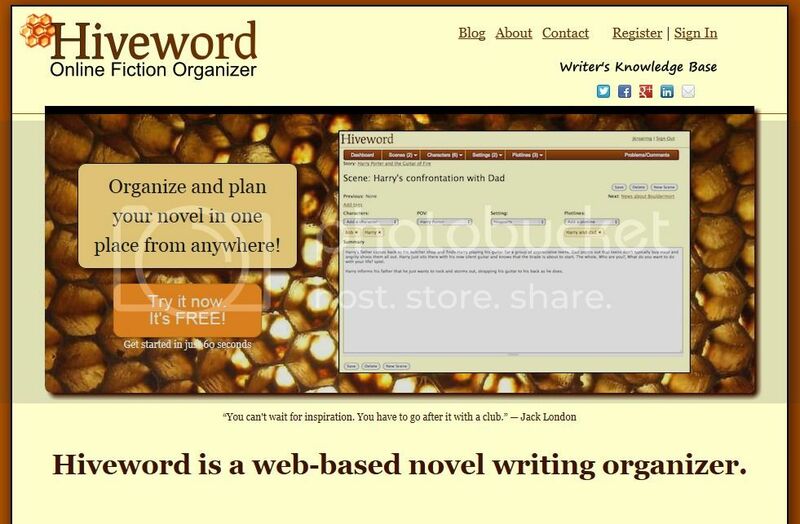 If you're thinking about writing your first novel this November, want to become more organized with ongoing projects, or simply want to play with novel-writing software to see what it can do for you, I highly recommend Hiveword. *Added: I just learned from the designer that Hiveword is going to be free forever, not just for NaNoWriMo, so one more huge reason to love it. Lynn, thanks for putting Hiveword through its paces and good luck to everyone with NaNoWriMo. Cool. I've been wanting to try this out but I hated the way it was set up at first to get the trial. I'll give it a shot now. Now I have to go and find out what Duotrope Digest is, lol. I signed up for Hiveword weeks ago. So far though, I've yet to really put it through it's paces. I'm such a pantser, I have to force myself to use something like this though I must admit, for the ease of keeping track of characters, world building and other details, this is the cat's pajamas! I think it's especially perfect for creating series bibles. I wish I'd had it ten years ago for StarDoc; would have saved me so much time and effort. This sounds fantastic. One question I have - how secure do you feel with this site? I'm sure all accounts are password protected, but the hyper-paranoid in me is terrified by the prospect of putting my creative work on any server that could possibly be accessed by anyone other than myself. Do you have any concerns at all with potential plagiarism or hacking? Is there an option to use the software but store information locally? As for me, I feel reasonable secure with the site. Due to my own concerns about privacy I'd never store any part of a manuscript in progress online, but I don't have a problem working out characters, plot lines, chapters and so forth on Hiveword. Since it's a web-app, Hiveword can't work with local data but you can export your stories (along with all characters, scenes, etc.) to an RTF document that you can store on your computer. Being able to export just characters, for example, is on the list of things to do. If you want to stay truly local you might want to consider one of the various desktop novel organizers. Is it remaining free? Will there be a cost associated later? Dani, it will remain free forever. Just to clarify - this is for organizing only, right? Once I'm ready to start my first draft, I still will want somewhere - not the summary section of a scene - to put the text. Although I'm sure you could fit scenes and other text into Hiveword, Ravens, its purpose is to organize your novel, not host the actual text. If you need a freeware word processor try Open Office; that seems to be the most popular among writers I know. You can also get a free Google Docs account to store your files online if you need no-cost storage. I'd been stuck for many months on a historical novel I'm writing, when I came across Hiveword & Knockout. Voila. In a few weeks, by answering Knockout's prompts thoughtfully, I had a complete story. Then, using Hiveword, I organized the story in a way I'd never have been able to without it, to what I think and pray will work. 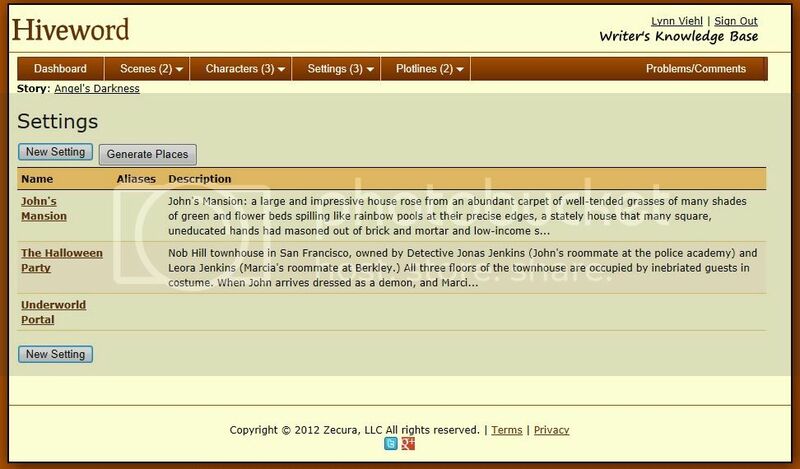 One of may favorite features of Hiveword is under the Scene tab, which appears once you click onto your novel. Under the Scene tab is the "sorter" option. The sorter is actually a storyboard that gives the writer what I think is great command of the novel. The whole novel is laid out right in front of your eyes. The names of your scenes are in boxes which are drag-and-drop switchable; if you realize, say, that a run of scenes is weak in the action department, you can drag any action scene from any other section to the weak one. You'll probably have to tweak the scene that you've moved to make it work in its new position, but that's what writers do. There are other programs that do all that, but they don't have prompts, and some require a PhD in engineering to figure out and actually use. Anyway, the combination of Hiveword and Knockout is a knockout. Priceless. Thank you M. Fleming.